Featuring 10 different games and six audio options, the Dual Shot provides interactive game play for hours. 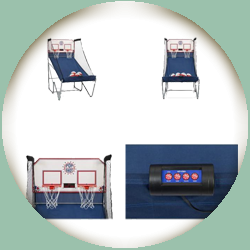 The height of the game can be configured for multiple settings and different-sized ceilings. Scoreboard is operated by batteries (provided) or standard electrical outlet.